In California, we have a phenomenon called “June Gloom,” where early morning cloudiness makes for moody mornings. The June issue of rez, however, is the exact opposite. Instead of June Gloom we have “June Bloom,” an array of superb writing from the best writers we know of. This month, we’d like to welcome Barbie Starr to the rez staff. Barbie starts her assignment as a roving reporter for rez, seeking out the best of the grid. Barbie highlights the Fantasy Faire exhibit, which raised record amounts of money for The American Cancer Society through its Relay for Life campaign. Barbie brings the event to life, with the photography of CallMeRory. We look forward to following her hunt in the upcoming months. RoseDrop Rust contributes a sweet ode to his Muse, wondering (as all artists do) just where she comes from and hoping she stays long. In Rusty’s case, she stayed long enough for a short poem, Muse Net, which leaves us wrung wet. A Gift is a particularly exquisite poem by one of our most sensitive voices, Dearstluv Writer - - a beautiful poem written by a beautiful poet, one who’s always listening and watching. Jami Mills and Amy Inawe share the second installment of their international crime caper, The Double-Crossers, which they wrote together in the exquisite corpse style. Watch Gretchen and Eva bob and weave through the cobblestone street of Rome, trying to catch a big fish. Cat Boccaccio, who says more with less than anyone we know, teases our olfactory senses with her offering, Makizmo, which describes haunting memories triggered by a familiar scent. The Dilemma is Art Blue’s contribution this month, where he carries on a fascinating discussion with a dead horse. You don’t want to miss this. No, really! And rounding out this wonderful issue is a poem by Shyla the Super Gecko simply called Little Person. Shyla watches a little sprite with understanding eyes, as the youngster questions everything in sight. She reminds us a little of Shyla herself in that regard. So there you have it! 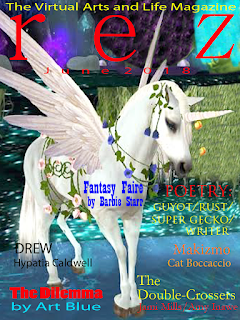 Enjoy the June issue.